WASHINGTON, July 15, 2010 (AFP) - At 23, Tran Thi Hoan dreams the dreams of a typical young woman: find a good job, start a family and, as a native of a country long ravaged by war, live in peace. But Hoan is a victim of Agent Orange, the herbicide laced with dioxin-tainted defoliant that was sprayed across huge swaths of Vietnam between in the 1960s and early 1970s, and she fears that she could pass on the poison that saw her born without legs and with a withered hand to her children. So she's let go of part of her dream. "Maybe my children will be disabled like me. So I don't believe I can get married," Hoan told AFP after she became the first Vietnamese victim of Agent Orange to testify before the US Congress. "I'm worried," she added quietly. Hoan had just read a three-page testimony in English to US lawmakers in a packed hearing room. "I am not unique, but am one of hundreds of thousands of people whose lives have been marked by our parents' or grandparents' exposure to Agent Orange," she said. "I was born as you see me: without legs and missing a hand." 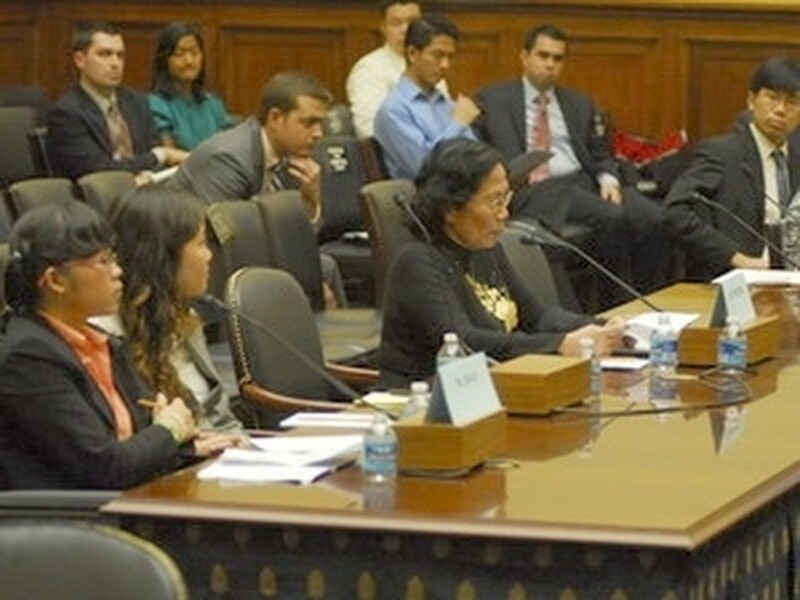 But in spite of her handicap, and in spite of her fears that nobody would want her as a wife, Hoan old the packed hearing called by Congressman Eni Faleomavaega, a veteran of Vietnam, to try to determine how to meet the needs of Vietnam's victims of Agent Orange, that she was "one of the lucky ones." "I'm missing limbs, but my mental functioning is fine," she said. Some Agent Orange victims do nothing but sleep, she said. Others fall ill with a slight temperature change. Still others die young, at age 10. "Many babies, children and young people live lives of quiet agony. They are trapped in bodies that do not work. Their brains remain in infancy even as their bodies grow." The American Public Health Panel estimates that some 77 million liters of herbicides, including 49.3 million liters of Agent Orange containing dioxin-contaminated defoliants, were sprayed over 5.5 million acres (2.23 million hectares) in what was then South Vietnam by the United States military. The aim was to destroy the densely wooded hiding places of the North Vietnamese enemy. Today, Agent Orange and dioxin, which is known to increase the risk of cancer, immune deficiency disease, and reproductive and developmental disorders, still contaminates the land and water. Vietnamese medical doctor Nguyen Thi Ngoc Phuong told the hearing that studies she has conducted have found that up to 4.1 million Vietnamese were directly exposed to Agent Orange during the war and more than three million have suffered its effects. Babies are exposed through their mother's breast milk. Others have been exposed by living in or near contaminated areas called "hotspots," such as Danang, where the United States had a base during the war. 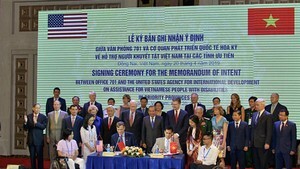 The United States, which reestablished diplomatic ties with Vietnam 15 years ago, is funding a program to "remediate" dioxin at Danang, or burn it at ultra-high temperatures of 350 degrees Celsius (662 Fahrenheit), which causes it to vaporize. Not doing anything would mean dioxin, which has a half-life of 100 years -- meaning it will take 100 years for it to fall to half its initial strength -- would still be tainting the land and people's lives next century. "My gosh," said Faleomavaega, "We'll all be dead and it'll still be there." Though Hoan's life has been marked by an event that happened decades before her birth, she insisted Agent Orange victims have to look to the future. "We can look at the past and see the consequences of war, but we don't want to stay in the past. We have to look to the future and see what we can do," she told AFP. And she added another wish to her wish-list. "We want those responsible for the terrible consequences of Agent Orange to hear our pain and respond to us as humans," she said, speaking not only for Vietnamese victims but for "the children and grandchildren of Americans who were exposed to Agent Orange and who are suffering like us." In the audience, a veteran of the Iraq war cried. Another applauded quietly. One of the chemical companies that made Agent Orange, Dow, says on its website that manufacturers were compelled by the government to produce the herbicide. In 2007, Dow said there was no evidence to link Agent Orange to Vietnam veterans' illnesses. And last year, a US embassy spokeswoman in Hanoi said there has been no internationally-accepted scientific study establishing a link between Agent Orange and Vietnam's disabled and deformed.